Every student knows the maddening feeling of striking out on finding a decent study spot. Campus may feel big during those first few weeks of freshman year, but when it comes down to it, we’re a big flock swimming in a small pond. When we reach crunch time—week 10 and finals week—open study spots become endangered species. Knight Library is out of the question. Your safe havens become crowded corridors. Freshman year, winter term, 18 credits. That was the slate. History 326 (Colonial and Postcolonial Africa) with associate professor Lindsay Braun cemented my fate as a night owl, and the final lived up to the class’s 300-level designation. My study efforts in the week leading up to the Wednesday morning test date, sadly, did not. I landed on a Tuesday-night walk to my girlfriend’s apartment, where I suddenly remembered that the hardest test of my college years began at 10:00 a.m. the next morning. An all-night study slog—combined with a painfully unnecessary fight with my girlfriend—rendered me dazed and drastically underprepared for test-taking. At 7:55 a.m., I stormed out of the apartment and wandered over to campus and into Lillis Business Complex with a pounding headache and a pressing need to relearn much of what I’d scarfed down the night before. I trudged up the first flight of spiraling stairs, stalling on the second floor in front of a glass-encased area housing various business school faculty offices. This mini-lobby was well-lit and inviting, and at this point, with the building quickly filling up, I wasn’t one to turn down an empty space. I walked in and started furiously scribbling. Productivity engulfed me and I felt the study gods’ juju raining down on my spread of books and notecards. Not one person interrupted my sitting march to the finish, and I busted out of the lobby door and back down the stairs just in time to grab a scone from the Lillis Café—one of the undeniable perks of this spot. I headed to Room 118 to face the inevitable brutality of the test. After plastering nearly eight pages of green book with essay answers, I walked out of the room with the tingling sense that I had just cemented my A in the class. Before I left Lillis for the last time that term, I pivoted to rest my eyes on my second-floor sanctuary one last time. I knew I would be returning. The Lillis lobby initially lured me with glass-adorned beauty, but it retains my loyalty because it’s a place I can make my own. For one, the doors lock at 5:00 p.m. The secret is that students already on the inside earn the privilege to stay and study in peace. This spot’s little-known virtue guarantees that sessions starting in the midafternoon can carry on uninterrupted into the later hours of the night. It became my go-to because I could claim sole ownership from the hours of 5:00 p.m. to midnight. Versatility is another winning quality of this spot. Though it lends itself to solitude, its transparent glass wall also provides a zoo-like experience that allows one to witness the flow of Ducks making their way to and from class, and popping outside to catch a passing friend is a good way to rejuvenate before returning to the grind. This place is a home base away from home for me. It’s somewhere I feel comfortable and in control, and that’s the key. It’s amazing how a spot like that can find you when you least expect it. 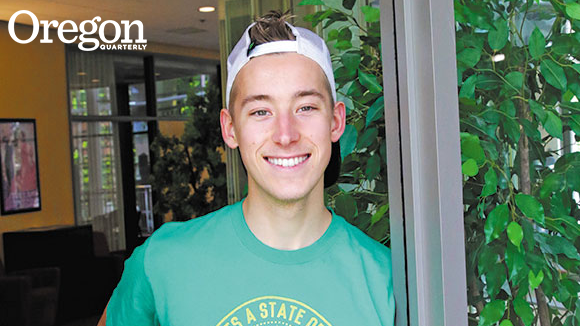 Advertising major Cameron Kokes, Class of 2017, is an aspiring copywriter sustained by long runs and hefty scoops of peanut butter.